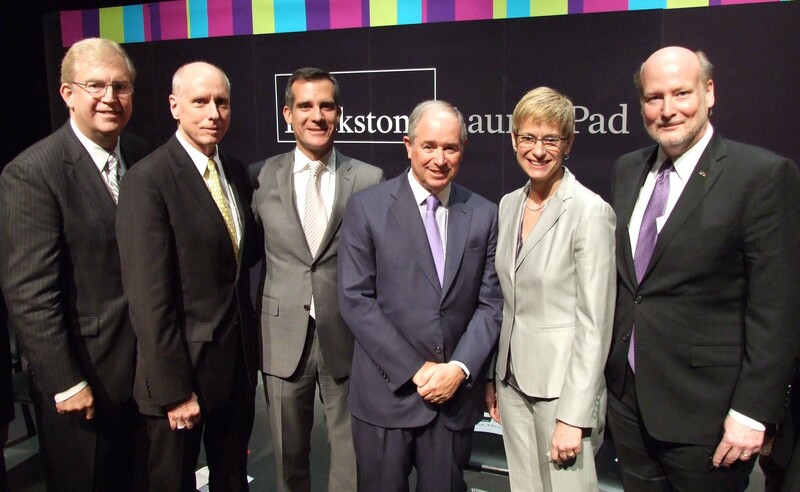 Los Angeles, California, February 21st, 2014 – The Blackstone Charitable Foundation today announced another expansion of its campus entrepreneurship program, Blackstone LaunchPad, to Southern California. Southern California becomes the sixth Blackstone LaunchPad region, following Michigan, Ohio, Pennsylvania, Florida, and Montana. The Blackstone Charitable Foundation’s three-year, $3.5 million grant will establish a partnership between The University of California, Los Angeles, The University of California, Irvine, The University of Southern California, and The Los Angeles County Economic Development Corporation to introduce entrepreneurship as a viable career option and provide over 110,000 university students, regardless of major, with a network of venture coaches and an entrepreneurial support system. Blackstone LaunchPad California will foster connectivity between the university campuses, business community, and local entrepreneurs to create an environment that nurtures students and provides them the skills and network necessary to succeed as entrepreneurs. With a physical presence on each university campus, Blackstone LaunchPad has the potential to generate some 1,400 new ventures in California over the next five years. Blackstone LaunchPad is modeled after a successful program developed at the University of Miami in 2008, which has generated 1,703 business proposals, 559 new jobs and drawn over 3,600 participants since its establishment. Each regional program established through the Blackstone Charitable Foundation is linked together, drawing ideas and best practices from across 11 campuses, giving student entrepreneurs in southern California access to a national community of over 350,000 of their peers and expert advisers. Funding for this program is made possible through The Blackstone Charitable Foundation’s $50 million, five-year Entrepreneurship Initiative, which seeks to target support services regionally for aspiring entrepreneurs creating the high-growth ventures that are known to spark economic growth. Due to the early success of the program following its implementation in Michigan, The Blackstone Charitable Foundation was recognized by President Obama’s “Startup America” Initiative and pledged to expand LaunchPad to five new regions over five years. This expansion to southern California fulfills that pledge. UCLA is California’s largest university, with an enrollment of more than 40,000 undergraduate and graduate students. The UCLA College of Letters and Science and the university’s 11 professional schools feature renowned faculty and offer 337 degree programs and majors. UCLA is a national and international leader in the breadth and quality of its academic, research, health care, cultural, continuing education and athletic programs. Seven alumni and six faculty have been awarded the Nobel Prize. For more information, visit http://www.ucla.edu/. Since 1965, the University of California, Irvine has combined the strengths of a major research university with the bounty of an incomparable Southern California location. UC Irvine’s unyielding commitment to rigorous academics, cutting-edge research, and leadership and character development makes the campus a driving force for innovation and discovery that serves our local, national and global communities in many ways. For more information, visit http://www.uci.edu/. The University of Southern California is one of the world’s leading private research universities. An anchor institution in Los Angeles, a global center for arts, technology and international trade, USC enrolls more international students than any other U.S. university and offers extensive opportunities for internships and study abroad. With a strong tradition of integrating liberal and professional education, USC fosters a vibrant culture of public service and encourages students to cross academic as well as geographic boundaries in their pursuit of knowledge. For more information, visit http://www.usc.edu/. The LAEDC, the region’s premier economic development leadership organization, is a private, non-profit organization established in 1981 under section 501(c)(3). Its mission is to attract, retain, and grow businesses and jobs for the regions of Los Angeles County. Since 1996, the LAEDC has helped to retain or attract over 190,000 annual jobs in Los Angeles County with an estimated labor income, including wages and benefits, of approximately $12 billion. Learn more at www.laedc.org.